Businesses complain that it is difficult to obtain and maintain people’s attention. But this is because they are acting like businesses; they use synthetic mechanical processes to communicate and interact. They have forgotten how to love. Yes, businesses can love customers, and love is the strongest bond possible; however, love has many nuances and subtleties, and it requires most businesses to change their attitudes and behaviors significantly. Happily, love is not an all-or-nothing proposition; businesses can use incremental approaches to change. Businesses that rediscover their humanity and true love for customers will outperform their peers, and this post shows how to get started. One more thing before we dive in. I discovered true love in business by accident while developing and practicing experiential social media. Since 2006, I have been conducting ethnographic research of social media and analyzing behavior of tens of thousands of people, people in their natural habitats, without interacting with (or biasing) them. And I have formed and subsequently tested hypotheses about their behavior by interacting with them. I have mentored clients in diverse sectors in how to practice true love for customers. And it works, beautifully and universally. 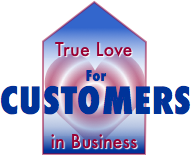 We need to start by defining what true love for customers is, and what it isn’t. Most businesses think that they love their customers already; their marketing and advertising say how much they “love” customers, but it’s rarely true, as I’ll suggest below. Herein is the opportunity. There are many forms of love (the ancient Greeks recognized seven), but they have many things in common that are not practiced by businesses today. I intend this short list to be illustrative. You show love by giving a person the benefit of the doubt. Honor her thoughts, opinions and experiences, even when—no, especially when—she is angry and upset. My firm’s results show consistently that trusting people is a powerful way to show them that you love them—and they overwhelmingly respond by trusting and loving you in return. When you trust customers, you honor them, you love them, and they are moved, especially because many people have little true love and trust in their lives. Most people are bombarded by thousands of wooden, synthetic messages every day, but they have very little love; they long to be listened to, considered, cared for and trusted. I feel very sad when I observe people and businesses asking, even demanding, that they be loved. Because I have learned that love is something you give. You give it, without expecting anything in return. Because loving someone is a complete act that requires no response. When you love, really love, people feel it, and most people love you back as best they can. But the key is giving love freely, without expectation. Loving is most powerful when it is given unconditionally. Vulnerability is trust at the reptilian brain level since it’s often closely wired to survival. When you allow yourself to be vulnerable, you are trusting customers by exposing yourself to them. You are voluntarily taking risks, and you can make this gift even more powerful by communicating that you are intentionally vulnerable to customers (because most people become vulnerable by mistake, few do it voluntarily). Choosing to be vulnerable is a very powerful way to create relationship. When a customer’s need or desire conflicts with yours, you have the chance to choose to value your relationship more than the transaction at hand. When you put a customer first, you validate him and create a powerful connection. This makes business sense because love and trust, when freely given, usually result in reciprocal love and trust. In business, probability matters because, although I propose loving individual customers without expectation, the probability holds that most individual customers in a group will love you back. I have consistently seen this when mentoring teams in experiential social media. It means listening to and caring for customers as individuals. Not “customers” or “consumers.” Not demographics or personas or psychographics. Individual relationships. This means that you approach every touchpoint between your organization and each customer as an opportunity to show your love. No one can love a person unless s/he makes the effort to know her/him. This means active listening, taking one’s time and focusing one’s energy. Acting like a person—not how most businesses act today. I look forward to your reactions to True Love for Customers. Before practicing experiential, I would have never dreamt of writing this post, but my work has led me deep into people’s emotions and motivations, so I’ve learned how powerful love can be in business. Not manufactured, mechanized, synthetic “love,” which is what most businesses offer up today. Experiential may be unique in its combination of deep qualitative and quantitative insights. Here is how each of the parts I mention above presents in business. This means putting the value of each customer’s relationship with you above the value of an individual transaction. For example, many firms’ policies are full of fine print that prevents customers from doing things (like returns). This screams that you value transactions, not relationships. Sure, your lawyers and actuaries will say that you’ll lose your shirt if you deep six the fine print. If you trust your customers, and let them know that you’re trusting them, most will honor you by buying from you more often, and at higher prices. But you must trust them first. And consistently. And trust is not a tactic, it’s a belief and commitment. Businesses that trust customers are very rare. Expecting love is the fastest way to kill it because expectation infringes on the other person’s free will, and true love comes from free will. Because giving love is what makes it the strongest bond between humans. Love means discretionary choice. Recognize customers’ discretion to make the choices that make the most sense for them, in their opinions. So maybe you spend a lot of time talking with a customer, helping her understand how to use a product/service, and she says that she likes the competitor’s offer better. Note that she is honoring you by telling you her truth. So, this is the time to recognize the power of love. By taking the time to talk with her, without expectation, you can now be happy that you have helped her arrive at a decision she’s comfortable with. And you can smile and tell her that. Nested within this interaction is the fact that you value the relationship more than the transaction. And she will remember that if it is true and sincere; this can’t be faked. Encourage her to come back if she has any questions, and do this without expectation. Let go of trying to influence her behavior in any way (trying to influence infringes on free will and reflects mistrust). Trust that she will become your customer if/when it makes sense to her in future. Honor her free will. Remember, when this interaction occurs in digital public (the Internet somewhere), many other people see it, too. Businesses that focus on new sales transactions haven’t learned that the key to profit is usually customer lifetime value, which increases when people buy more things more often. Most people incur a loss when buying things, and they have the burden of using the product or service they bought to create value or meaning in their lives. But when you love them, and they love you, your relationship rises far above the product or service; they don’t experience the purchase as a loss, but almost as a transfer between friends or family. You maximize CLV by loving customers. A common opportunity to show your love is when things go wrong. It doesn’t matter if a customer is “right” or “wrong.” More important is that he’s unhappy. Does it really matter why? It doesn’t, if you value relationship. Customers are busy. They take the time to contact you when they are unhappy, thereby giving you an opportunity to relate to them on a different level. The most important thing is to love the customer in front of you by listening, by discovering why he’s unhappy and by helping him to fix the problem. Customers feel it when your foremost goal is supporting them, not taking their money. One of the most powerful things I teach is how to love angry frustrated people who are berating or insulting my clients in digital public. It always turns out beautifully. Meeting anger with love is exquisite, and transformational for clients. One of the most powerful ways to be vulnerable is, when you’ve suggested common remedies and the customer doesn’t like them, ask, “What would you like me to do to make it better?” Try this ten times. I have seen that when you ask this, customers are fair because they understand that you trust them and their judgment. Doing this in digital public is even more powerful because it increases the scale of your vulnerability and love. And my experience shows that people are fair overall and will not take advantage of you. A few will, but they will be more than offset by all the people who observe you loving someone like them—and loving you for caring and daring to be vulnerable. Most businesses don’t understand the network and annuity effects that result by interacting in digital public. The thing is, love grows between individuals. Yes, one can love one’s town, company or country, but this is a different kind of love. When you love individual customers in digital public, other people will feel vicariously that you love them, too, because other people with similar interests will find and observe your interaction (network effect), now and in the future (annuity effect). So by loving individual customers, you show by example that you love other individuals like them. True love can enjoy the digital multiplier, too! Active listening is a powerful way to show that you value people—because you take the time to validate your understanding before responding, and you show your respect for the person through your interaction. This also clarifies the situation for observers in digital public. Executives pull their hair out because customers are so fickle (millennials are a frequent target for frustration), but this is because businesses, in their multi-generational quest for efficiency and scale, have forgotten humanity and love. Initiating and nurturing your love for customers in digital public is immensely scalable, but to experience it, businesses must throw away their legacy-based attitudes and processes. There is another aspect of loving customers that is transformational for organizations: employees, once they learn how, love loving customers because their work becomes immensely satisfying emotionally, even spiritually. I’ll delve into that in another post. Why firms need to stop thinking like businesses, and start thinking like people: On Human Experience. How firms unknowingly discourage people from trusting them: Many Businesses Live in Fear—How to Break Free. The breakthrough power of trusting customers: How Trusting Customers Drives Profit. How trust monetizes: The Trust Business Chain Reaction. Short background on experiential social media. How we start building empathy and trust: Ethnographic Research of Social Media. ~ Companies have some built-in aspects that allow for “without expectation” aspects, yet this approach opposes the traditional business foundation & definition of a transaction. Digging up such roots seems like a tough approach to accept. On the other hand, I wonder how the skepticism of customers that receive what’s “freely given” can be mitigated. ~ The “intentionally vulnerable to customers” was very unclear to me, so I’m glad that you provided the public relations example later in the post. Also, it was good to see that you included information on “customer lifetime value”. ~ I believe your sidebar – “It doesn’t matter if a customer is “right” or “wrong.” More important is that he’s unhappy. Does it really matter why? It doesn’t, if you value relationship.” – seems to contradict later copy. ~ Beautiful — “What would you like me to do to make it better?”. I just asked that question over Thanksgiving, which worked to diffuse a family argument pretty quickly. LOL. For business situations, it might involve major flexibility over the “what” and/or systematic changes that support such leeway. ~ Lastly, in regards to valuing individual customers — I always think about this aspect in terms of review sites. How a company responds on Yelp or Glassdoor to individual reviews majorly colors how I view the business from that point forward. It seems that’s a common phenomenon based on your research. Hi Kesha, thanks for your reaction. Yes, although every organization could improve its results with higher trust, right now, most are not ready for this. The thing is, I think trust is the ultimate human crown jewel, and to earn trust, firms have to make some hard choices. They have to be willing to let go of some sacred cows, like the making the brand look good at all costs. This message threatens many but resonates with a larger audience every year. In practice, teams focus on a discrete part of the client’s business to demonstrate real results in terms that make sense to management and employees (without touching legacy practices). Then we scale it. So it becomes a trade-off; we usually get 100s of percentage points better marketing results than established marketing practices. When clients see that, they’re willing to try the “without expectation” ethos and other changes. Thanks for calling out the “right” or “wrong” statement. I was trying to refer to different attitudes firms have. For some, the “customer is always right” while others are suspicious of customers and treat them as if they are always wrong. I’ve seen that both sides are less important than helping customers attain their outcomes when they use our product/service. Thanks again for weighing in!